From the time you enter through the gates of the Taj Falaknuma, the grandeur and the elegance is going to leave you spellbound. A palace which has enthralled many dignitaries in it’s 122 year history isn’t just to be seen. It’s an experience of a lifetime to carry back with you. It’s not everyday you get a chance to walk through beautifully handcrafted history. 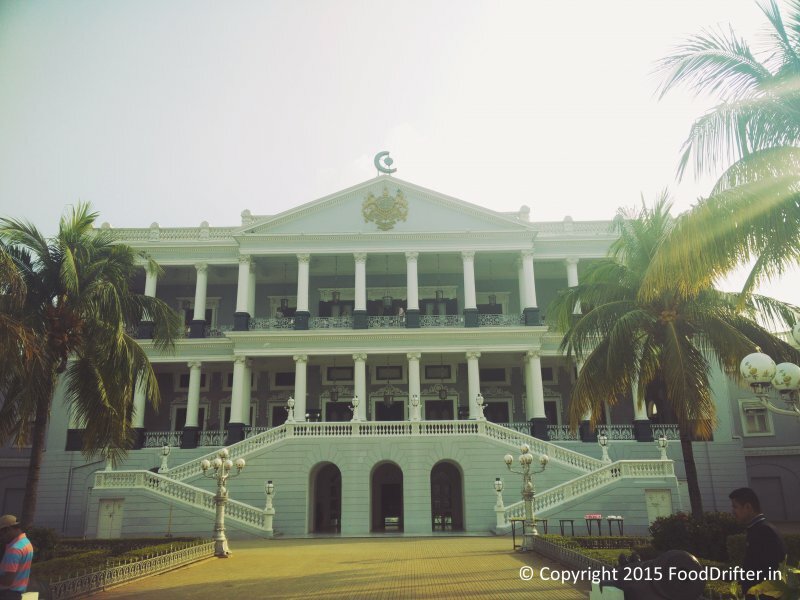 A history so rich that it even made the Nizam of Hyderabad fall in love with the palace. We were glad to be part of the special Invite for the Tour & Hi Tea Celebrations. The Falaknuma Palace was constructed by Vikar-ul-Umra, the then prime minister to the Nizam of Hyderabad. It was handed over to the Nizam of Hyderabad as a nazar (offering) by the prime minister to use as a palace to entertain his guests. The story goes that the Nizam had initially come to the Faluknama Palace to stay only for 2 days. He fell in love with the palace so much that he continued onto stay there for a month. Faluk-numa literally translates to “Mirror of the sky” in Urdu. Here in the post below we take you through the walls of history of the Taj Falaknuma as it gears up for it’s 5th anniversary celebrations on the November 13th. Through it’s ornate paintings, magnificent rooms, the opulent staircase, the huge palatial grounds as it towers over the city of Hyderabad and the grandeur that is Falaknuma. Soon as you enter through the palace gates and ushered in, a battery operated cart takes you all the way to the palace grounds. This is a followed by a welcome drink as you’re left to soak in the magnanimity of the palace. The palace historian Prabhakar awaited to take us through the journey that is Falaknuma Palace. A walk around the palace grounds unravels the story in layers. The palace grounds are filled with peacocks which have made it their home. They also have a stable housing the horses and a horse-drawn carriage that you can use for special occasions. As you gradually move into the palace, the first entry is to the Taj Khazana, where some of the splendid, intricate rare treasures, paintings and finest collections of the Nizam are housed. From the Taj Khazana room, you are further led into the inner chambers which house the inner area and meeting rooms of the Nizam. Considering that the Falaknuma Palace is resemblance of sky on earth, you’ll find a lot of architecture and paintings are done to resemble celestial and sky objects. From angels and cherubs to birds and even dragons. The Library is a replica of the one at Windsor Castle and has one of the finest collection of books in the world. In fact the Nizam of Hyderabad was so rich that he used the Jacob diamond as a paperweight. The marble figurines supported by balustrades have been delicately carved. They have candelabras at regular intervals. The Falaknuma Palace was one of the first palaces in India to get electricity. The electrical systems have been designed by Osler and has one of the largest electrical switchboards in India. It also has the largest collection on Venetian chandeliers. The pride of the Taj Falaknuma is it’s famed dining hall table which has seen many royalties, noblemen and dignitaries dine in. The dining table can seat up to 100 people with the tableware being made of gold and crystal to which fluted music was added. The High Tea is one of Taj Falaknuma’s highlights of the day. The nobility that comes with watching the sun set over Hyderabad from the terrace balcony. The menu at the High Tea is vast and elaborate. Featuring a eclectic mix of Hyderabadi, Indian and Continental, there is something in it for everyone. There are the healthy juices, shakes, cold coffees and lassi. Then come the huge variety of sandwiches, bruschettas. But the Hyderabadi Indian section of the High Tea is worth checking out. They at any moment in time have the Lukmis, Bun Maska, Keema Buns and lot more which are specific Hyderabadi specialties. And the talk before of dining in royalty. Below pictures are a testament of the opulence of the terrace as you face out to the city of Hyderbad and the sky merges with the horizon in the distance. These pictures cover the balcony and the Jade Room where the artworks of local artists are displayed. The Taj Falaknuma is impressively beautiful in the night as all the lights slowly light up to reveal it’s splendor. As we leave the Taj Falaknuma, we don’t leave with just an experience but with an everlasting memory. It’s truly a piece of eternity created on earth. There are no videos allowed inside the Taj Falaknuma and we rightfully stand by that decision too. An individual visit is what you’ll need to feel the magnificence and majestic beauty of the Taj Falaknuma. Here is a small video below of the palace as it slowly fades out into the distance as we take leave. As part of the ongoing 5th Anniversary celebrations of the Taj Falaknuma, Colombian Saxophonist Dumbira enthralls visitors during High Tea.